More Travel. More Adventure. More possibilities than ever. That call to travel the world tugs at your heartstrings. Maybe you know exactly where you want your next adventure to take you. But maybe you don't quite know yet. 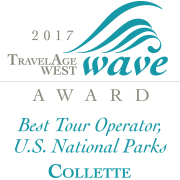 No matter where you find yourself in your travel planning process, Collette's guided tours can take you to all seven continents on life-changing adventures. All you need to do now is explore your options. From the pyramids of Egypt to the plains of the Serengeti, our Africa tours go to every part of this continent. Set out for the adventure of a lifetime and travel to Antarctica, the last frontier. Tours of Asia reveal ancient wonders, hyper-modern conveniences, a wide array of cultures, and more. Travel to Australia and New Zealand and experience the unique landscape and wildlife of these magical islands. Art, architecture, food, culture, and history come together in a Europe tour, a perfect combination for travelers. Experience natural wonders like the Grand Canyon and cities like Quebec when you travel to North America. Rich cultures, golden beaches, ancient cities and incredible jungles are all here in our South America tours. As seasoned travelers, my spouse and I have come to appreciate two main aspects of guided tours - the quality of the itinerary and the professionalism of the tour guide. On both counts, this tour succeeded beautifully.